You will earn a smaller cut of the profits from your sales (60% as opposed to 85%) and be charged 30¢ per transaction, but you will be able to start your own store without forking over a dime. You can watch TpT YouTube tutorials like the great ones offered by Kayse Morris. You can follow blog posts, targeted Facebook groups (like TpT Tips and Advice, an awesome group run by Misty Miller), and read up on useful information in the TpT forums. If you are willing to spend your time learning, you won’t need to fork over your hard-earned profits…at least not right away. Instead of paying for ads, market your products through Pinterest, FB, Instagram, and other social media outlets for free. Make connections with other sellers and they will be sure to shout you out as well. You may even find yourself taking advantage of guest-blogging or giveaway promotions. There are lots of ways to showcase your store and products without spending money. It doesn’t cost money to submit a freebie to the TpT Newsletter or a social media post to the TpT blog. If you get lucky, your products will get seen by thousands of buyers and all it took was a few minutes of your time. You can now even submit social media shout-outs (up to 3 per week) by clicking here. Instead of hiring a graphic designer to make your logo or store banner, do it yourself. Make your own great covers instead of hiring a virtual assistant. There are great tutorials available to learn the basics of design and how to complete technical tasks related to TpT. Although it is nice to be well-branded from the beginning, you also need to be realistic if you do not have the funds to outsource these tasks – believe me, I’ve been there! 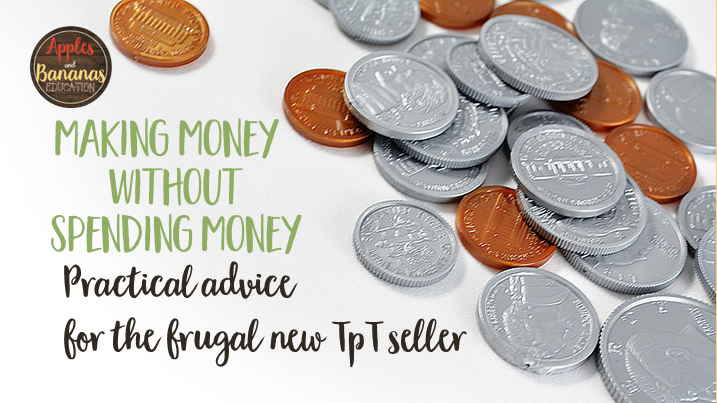 Do not let money be an obstacle to starting your own TpT business. Many people do not have excess money at the beginning of their TpT journey – in fact, many people hope to earn money on TpT and that is their reason for getting started in the first place. When you begin earning money, and have a little bit to invest, there are several things you can do to really boost your store to the next level.